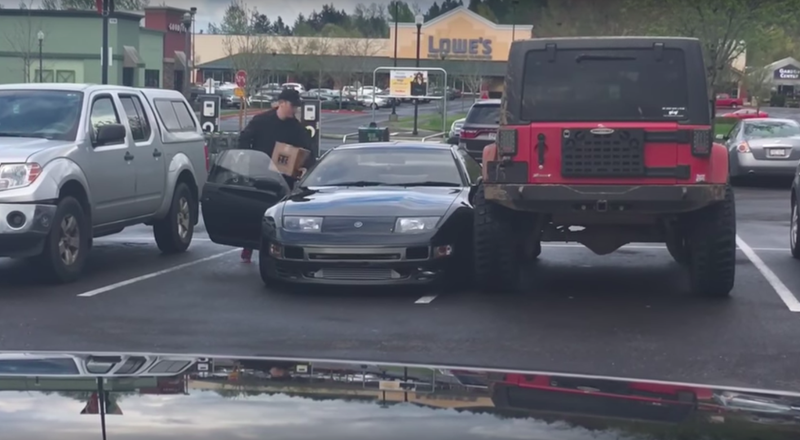 When some yahoo in a gorgeous Nissan 300ZX decided to park his car over the line, another yahoo in a jacked-up Jeep Wrangler tried showing him who’s boss, but failed miserably. Because he forgot to account for JDM. This video is cute, but almost certainly staged. One look at the YouTube account—Valic Hunt—and you’ll see he’s got a few other videos posted showing essentially the same type of Jeep antics, one of which we’ve already debunked. 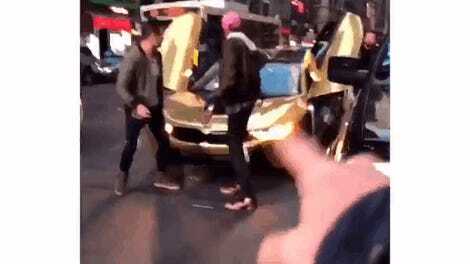 Between that, the fact that there just happened to be a guy recording this dorky situation, and the smile on the 300ZX owner’s face (come on, he should be furious), and there’s just no way this isn’t staged. Still, it’s a funny joke. The Jeep creeps up nice and close to the poorly-parked Nissan to show the Z-car owner who’s boss by making him get in through the wrong door and struggle to climb over the transmission tunnel. But the joke is really on the Jeep owner, because unless this is one of those mail carrier Jeep Wranglers (it’s not, you can see the driver’s head in the video), then this JK Wrangler driver likely had to clumsily exit through the passenger door. The Nissan Z32 owner, though? His driver’s door is on the right side. Because JDM, yo.